Hanoi is the capital of Vietnam and one of the best places to use as a base for travelling throughout northern Vietnam. 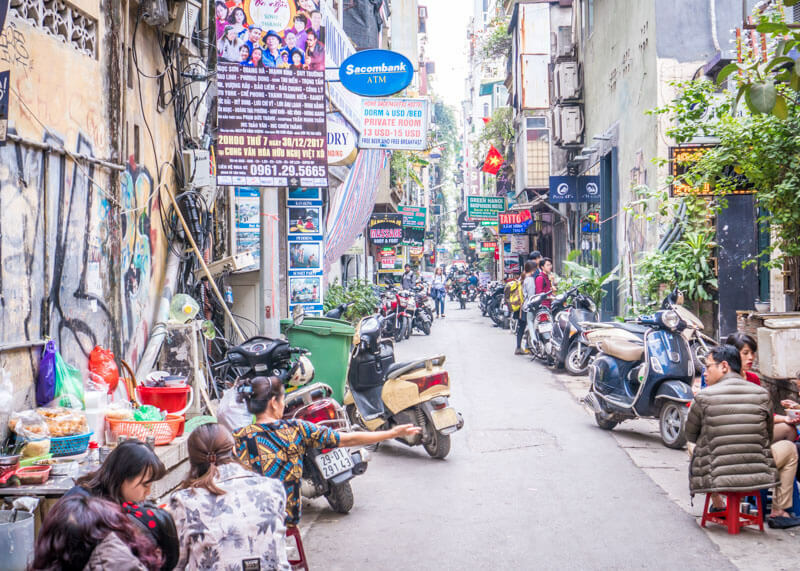 What you may not know about Hanoi is that it has a considerable dining scene for its seven million residents. 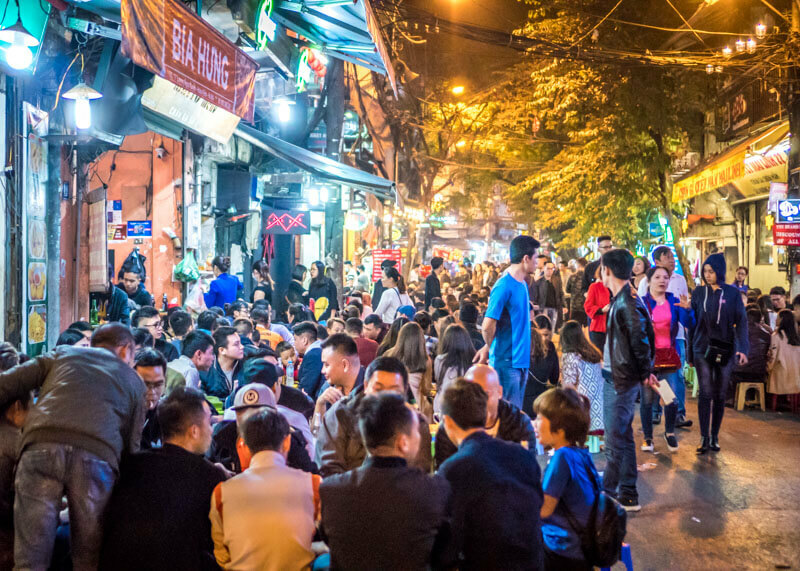 We spent most of our time in Hanoi during our year of travelling people watching and eating. Yup, eating alone kept us very entertained while in Hanoi during our year of travelling. I mean, Hanoi Vietnam makes it very easy to eat (and get fat, so bring your best buffet pants on the trip!). You will find some mouth-watering dishes along every street corner and every small alleyway. 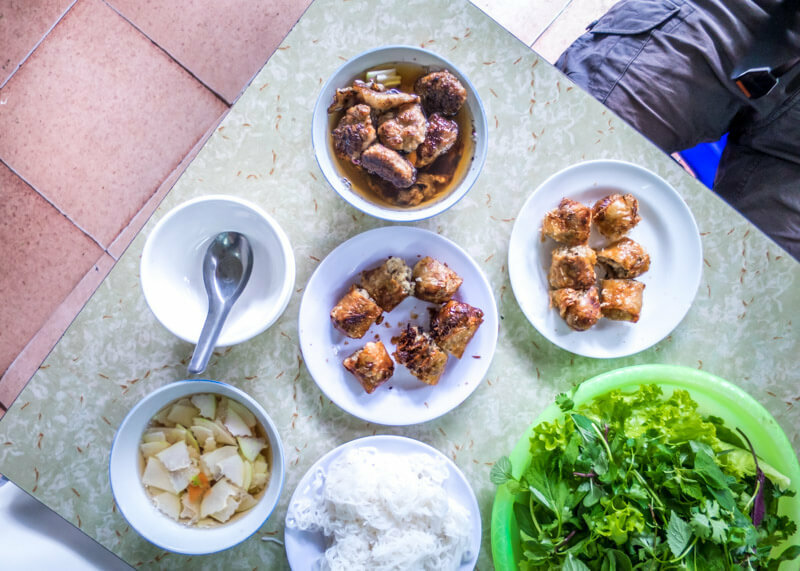 While there are lots to do in Hanoi Vietnam, I felt that good food was what guided us throughout all the different corners and areas of Hanoi. 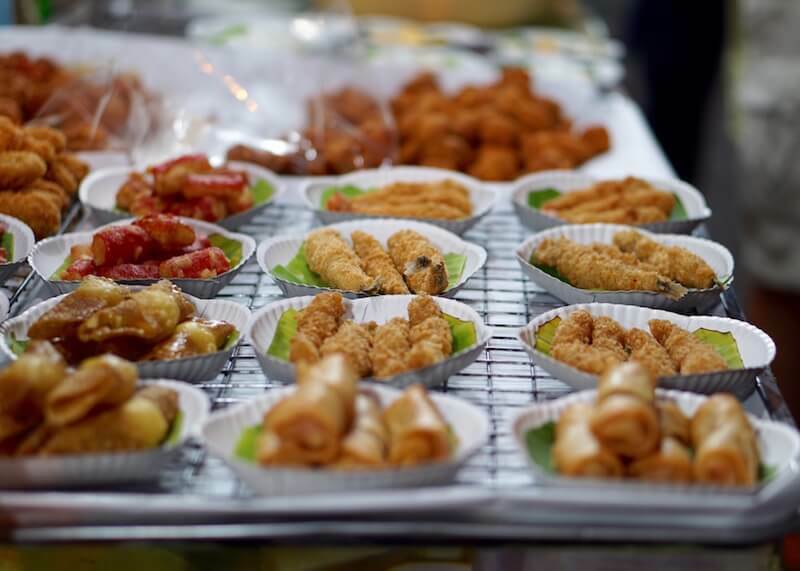 Planning what to eat in Hanoi is not an easy task as there are so many choices and restaurants in Hanoi. 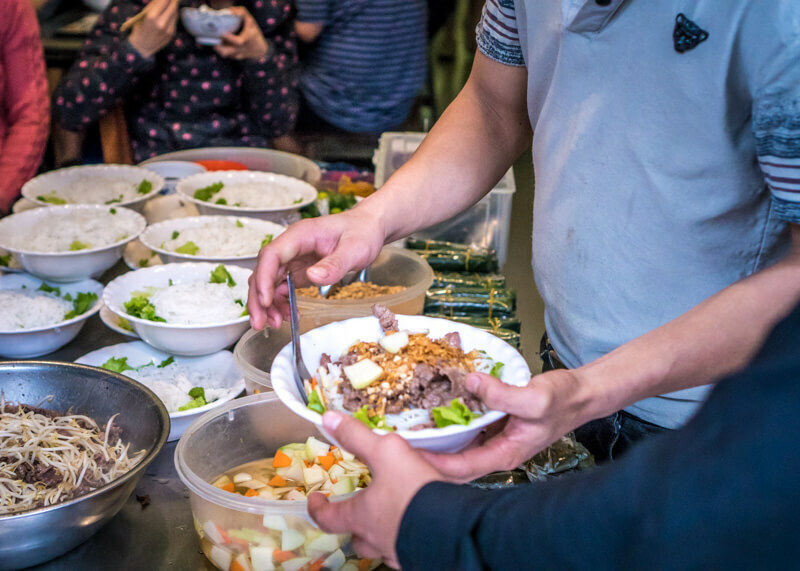 Add to the complexity are the endless street food choices in Hanoi, especially in the Hanoi Old Quarter. 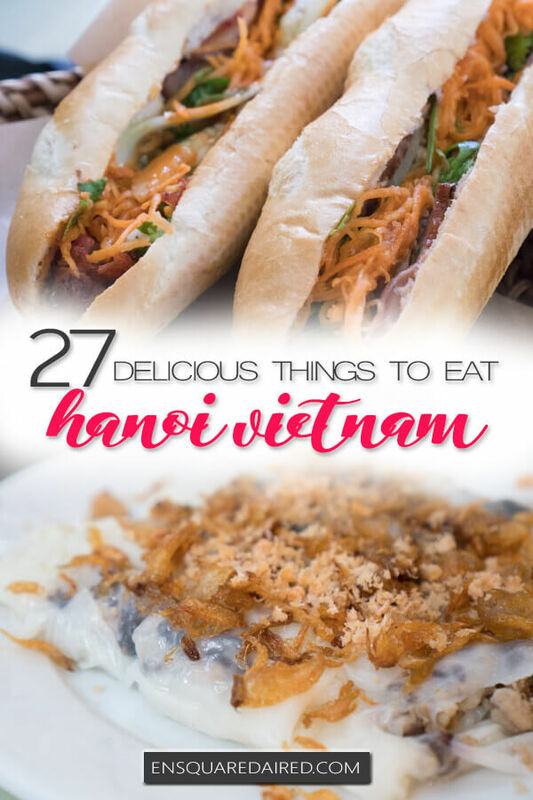 Well, lucky for you, I put together a detailed guide of some of the best food in Hanoi that you can find mostly in the old quarter. I also have “honourable mentions” that I consider to be good food in Hanoi and only worth trying if you happen to be in the area. 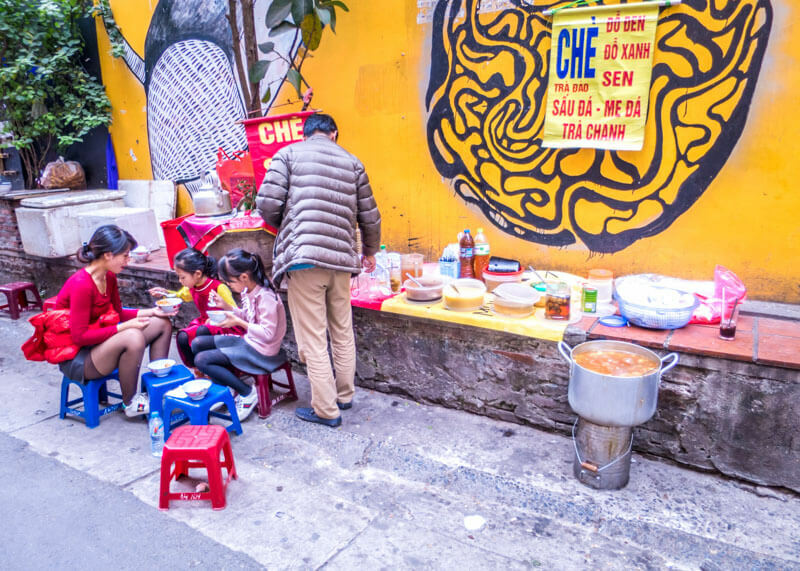 This good food stall is serving chè, a delicious Vietnamese dessert that can be either a sweet beverage, dessert soup or pudding. The best thing about the best food in Hanoi is that all the dishes fit into any budget! If you are a budget traveller, your wallet and stomach will be super happy at the delicious flavours at reasonable prices! 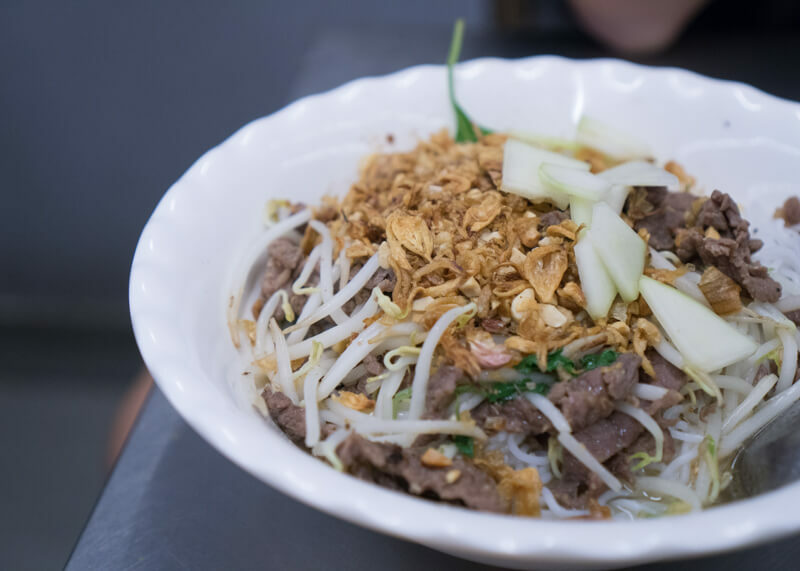 If there’s only one thing you eat in Hanoi, Bún chả is the must eat. 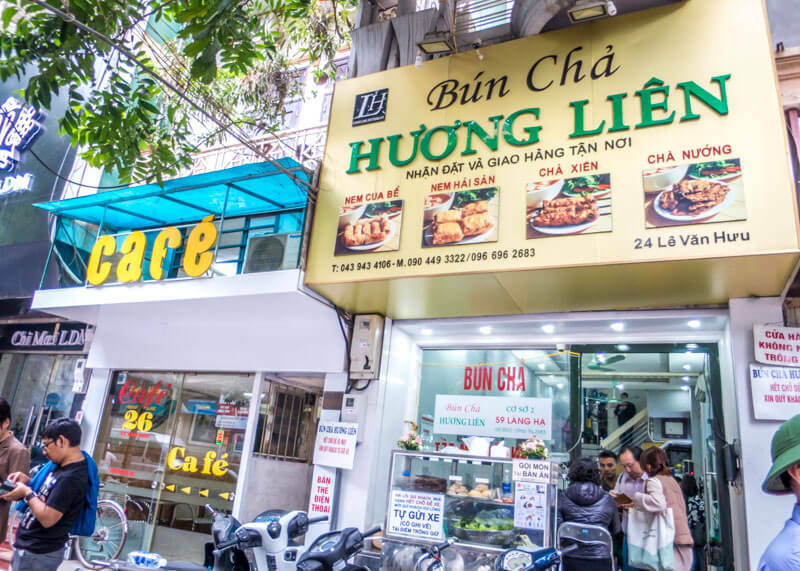 After all, bún chả is a local Hanoi specialty and without a doubt, the best Vietnamese food in Hanoi. This dish is also the one that Anthony Bourdain shared with Barack Obama during the former president’s visit to Hanoi. 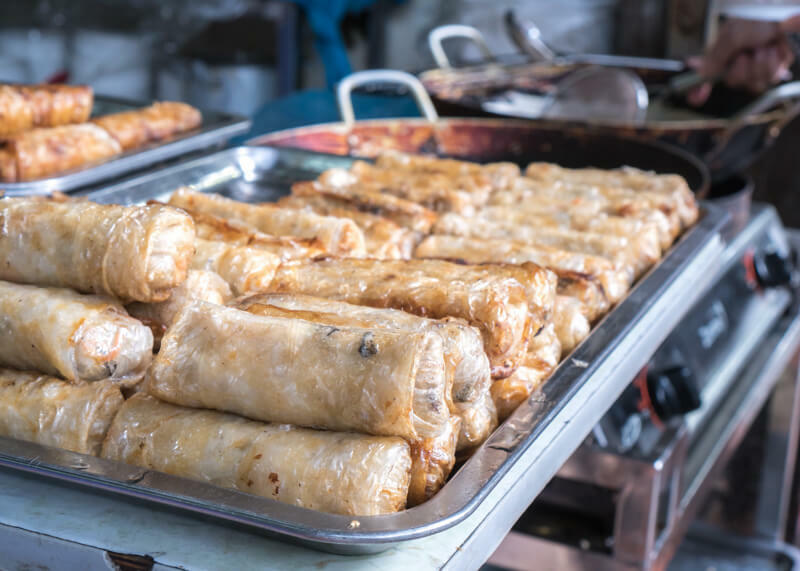 Delicious spring rolls made fresh in front of your eyes! 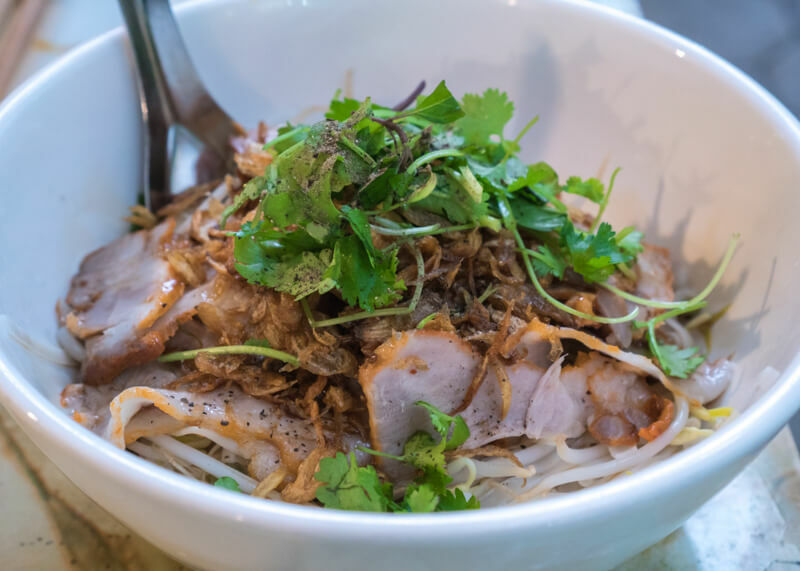 This Vietnamese dish contains grilled fatty pork served with a place of rice noodles, vegetables, fresh herbs, and dipping sauce. The dipping sauce is like a diluted fish sauce turned into soup with sugar, lemon juice, vinegar, garlic, and chilli. You will also find vegetables inside the dipping sauce like green papaya and carrots. I highly suggest reading reviews before going to a restaurant and avoid vegetables at all costs. Warning! Don’t bother with the lettuce or any fresh herbs. Many reviews indicated that most places reuse their vegetables. The wait staff will bring a few bowls to you all at once. Expect to receive a soup-like bowl full of meat, vermicelli, and vegetables. And…that’s it! I mean, this is how most people eat the dish, but you can be creative and eat it in any way you like. You can also wrap the meat with the vegetables and a bit of vermicelli to make yourself a nice vegetable spring roll. I personally wouldn’t touch any raw vegetables with a ten-foot pole. (unless you know the restaurant is REALLY clean). There are usually condiments at the table. Add in some crushed garlic and chilli for some extra flavour. 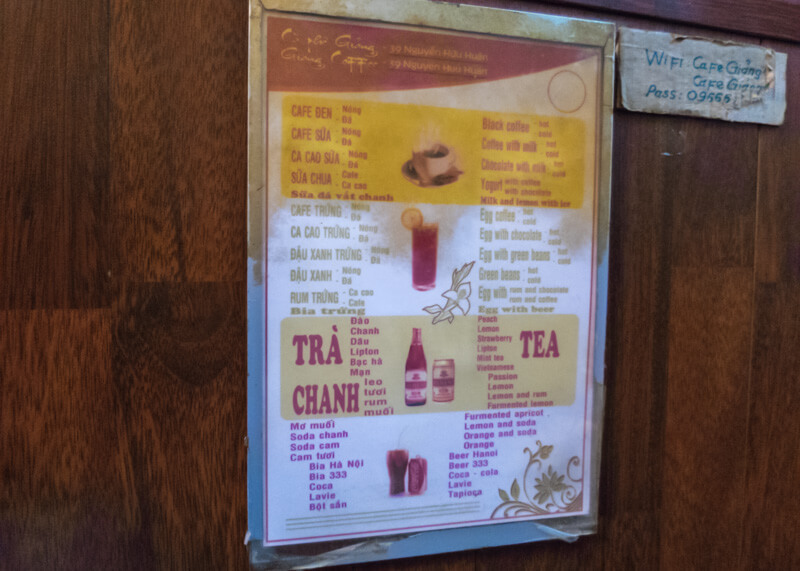 The menu is simple and taped along the wall. Bún chả (40,000 VND): grilled pork, rice vermicelli, fresh herbs in a sweet broth and vinegar fish sauce. Nem hải sản (30,000 VND): fried seafood roll with prawn, crab, pork, and vegetables (order one per person! It’s too good to share!). Nem cua bể (7,000 VND) for 1: Fried crab roll with crab, pork and vegetable. You can also order pork skewer and rice vermicelli. Prices are a bit on the high side as I suspect that the listed price is for tourists (it should be half the price). It’s about 90,000 VND ($3.85 USD/$5.03 CAD) for Bún chả and two pieces of spring rolls. But the spring rolls are SOOOOO good. Prices are within the 40,000 VND range per dish (which is what it should be!) and is a place that is less catered to tourists. I never made my way up here, but I heard they serve a mean dish of Bún chả. Bún bò nam bộ is a vermicelli noodle dish topped with grilled marinated beef, vegetables and pickled carrot. You then have the fish sauce to mix into the bowl, making this meal oh-so-yummy. Because there is little oil, save for the fat juices from the beef, this dish is quite healthy. The meat and pickled vegetables are often well marinated, making this dish a very flavourful one. Bún Bò Nam Bộ Hàng Điếu is your best bet. 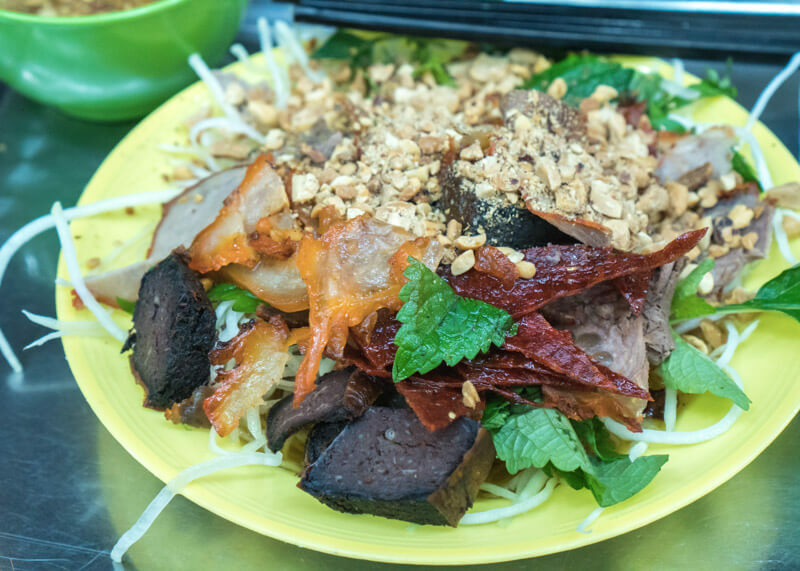 This beef noodle salad costs just 60,000 VND. I bought a side of giò (pork roll) 6,000 VND for one to complete the dish. This place was good in that it was busy with lots of Vietnamese locals and the food is made fresh at the front of the store. If you’ve never had phở before, please get out from under your rock (I’m kidding…sort of) and try this delicious Vietnamese soup. Phở is one of the most famous street food in Vietnam and is a must try for those new to Vietnamese cuisine. 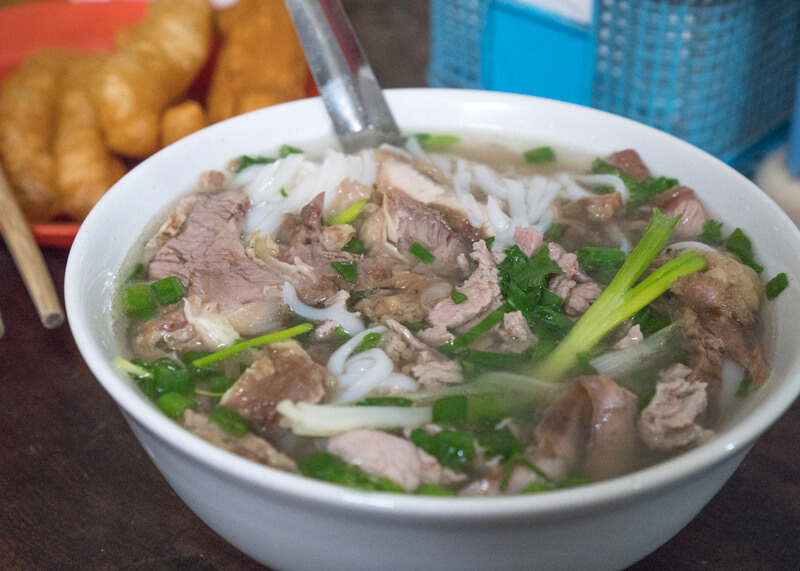 A typical Phở dish has four main ingredients: a flavourful broth, beef, rice noodles, and green onions. 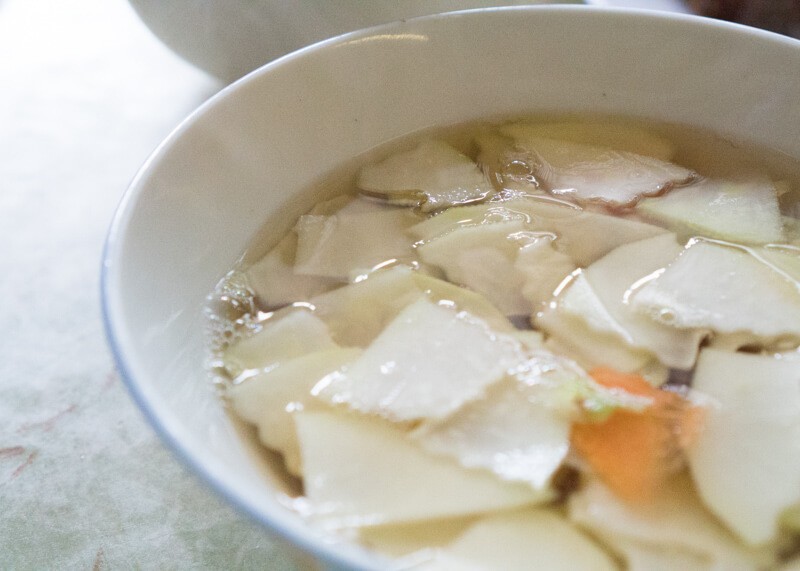 While I’ve had my fair share of Phở in my life, I never realized how different the broth tastes in Northern Vietnam. It is a bit milder and served with fish sauce. In South Vietnam, chilli sauce and Hoisin sauce are the main condiments you add to complete your dish. I won’t lie, I felt super lost when it came to figuring out what to add in my Phở. In my opinion, Phở is not the same without siracha sauce and hoisin sauce. Also, don’t quote me on this, but I think Hanoi is more known for its chicken-based broth soup. Another thing you must add to complete your bowl of pho is dầu cháo quẩy (油條) or Chinese doughnut. Dipping dầu cháo quẩy in Phở is seriously heaven to me and my favourite way to eat Phở! The food here is cheap, reliable and it’s busy almost every day. The place is very popular with the Vietnamese locals, and the tourists have caught on as well. 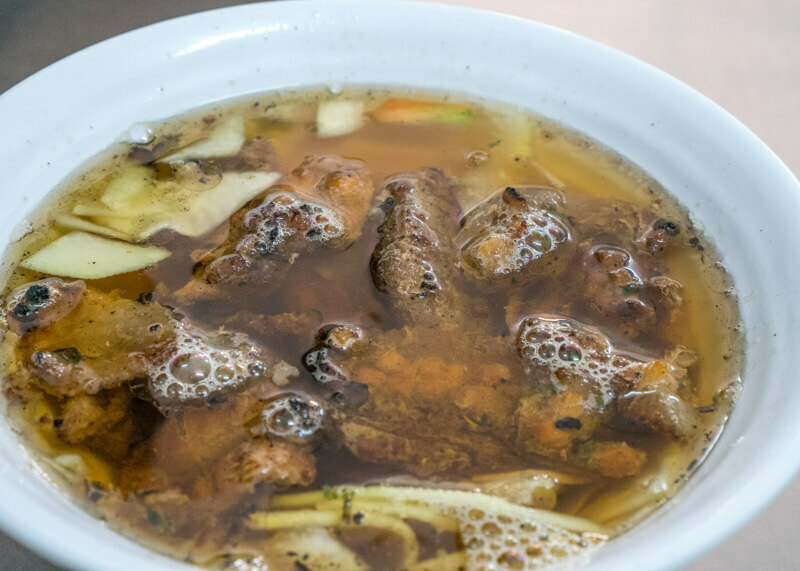 The broth is clear, light and served with lots of tender beef. Since there is no hoisin sauce or chilli sauce, you only have the fish sauce to flavour your broth. Be warned that the fish sauce containers aren’t the greatest. You have to use your spoon to pour in a bit of fish sauce and pour very very little into your spoon. I ended up pouring too much fish sauce in my spoon by accident and didn’t have any place to dump it. A local tapped me on the shoulder and told me to dump it into her untouched side soup. That was nice of her. Although I wonder now why I didn’t get a side soup. A word of caution; it will taste very bland compared to the Phở in South Vietnam or overseas. It’s still worth trying in my opinion, but you must order a side of dầu cháo quẩy. The staff also doesn’t speak English very well, but the menu is simple and easy to order. This place is also not very sanitary but don’t you worry; the piping hot soup broth will kill all the germs. This shop is highly rated. We didn’t have the chance to try this restaurant because it was closed when we passed by the first time. We actually made our way to this restaurant which turned out to be in a very sketchy alleyway. We weren’t sure if it was an imitation restaurant, so we decided to jet. It turns out, we found the right location and missed out on eating a delicious bowl of pho. Another highly recommended place worth checking out. You can eat Bánh mì for breakfast, lunch or dinner! If you eat a lot, then consider this delicious sandwich to be your midday snack! 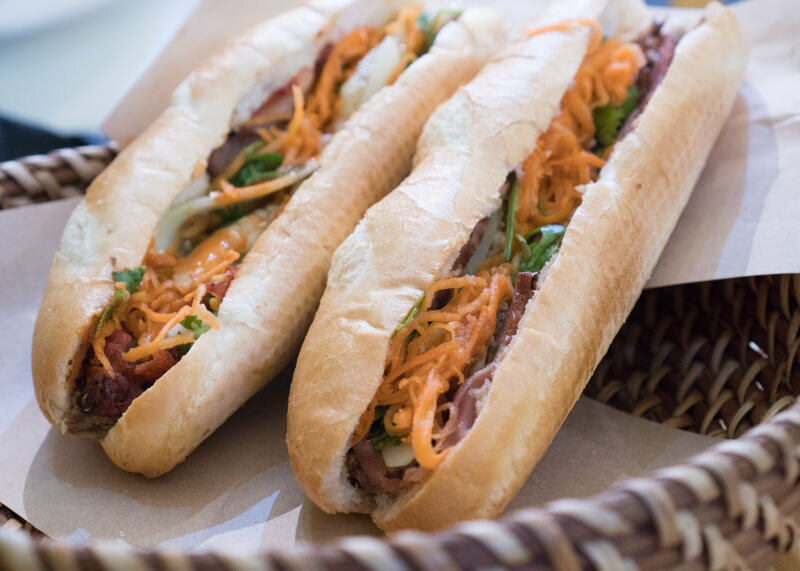 This affordable Vietnamese sandwich is a crunchy baguette filled with meats and vegetables. In case you didn’t know, the baguette made its way to Vietnam during its French colonization. This Vietnamese sandwich became a favourite street food item from Saigon (Ho Chi Minh City). 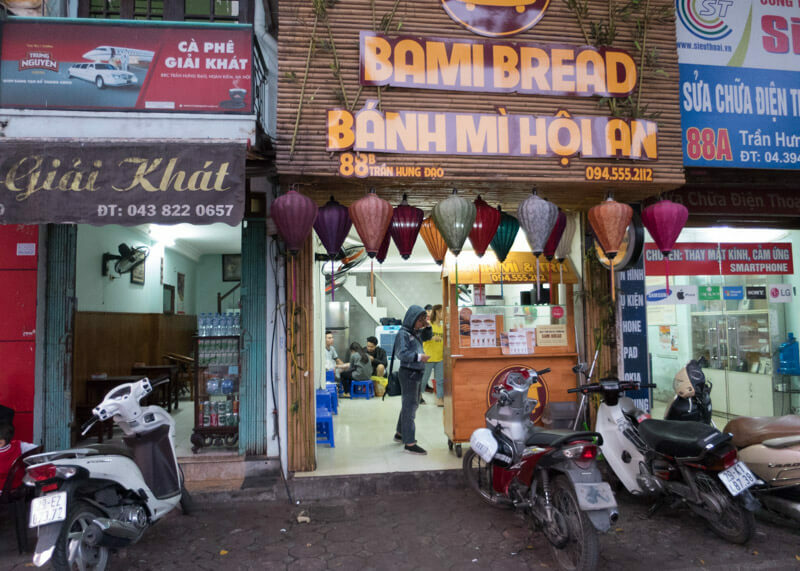 Apparently, the best Bánh mì are in Southern Vietnam, but there’s a few in Hanoi that gives the most popular ones in the country a run for its money. You can find seasoned pork belly, Vietnamese sausage, grilled pork, with pork liver pate (so good!) in a typical sandwich. Vegetables usually include cucumber, pickled carrots, and white radishes. There will also be condiments like soy sauce, chilli, mayonnaise (often homemade). Most places have a variety of meats to choose as your filling. My favourite is Bánh mì thịt nướng (barbecue pork sandwich). 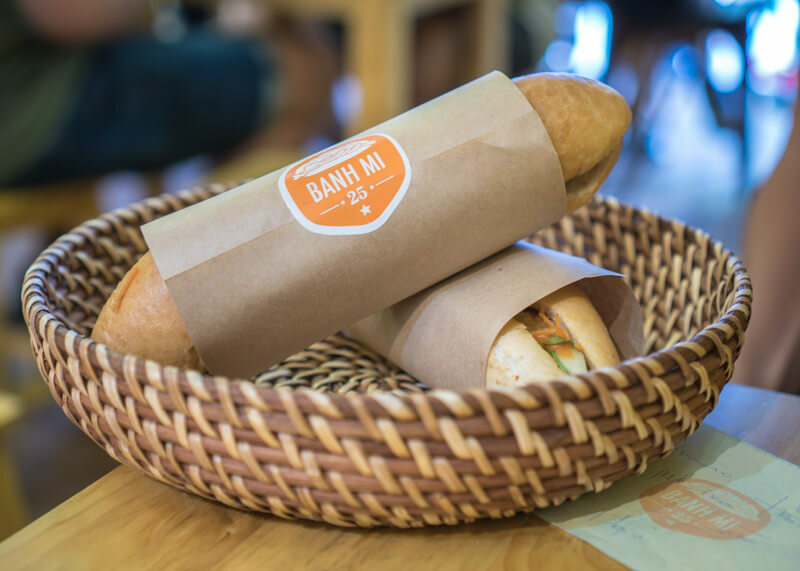 Another thing to note is that you might see bánh mì spelled as bánh mỳ in Northern Vietnam. This place is tourist-friendly. 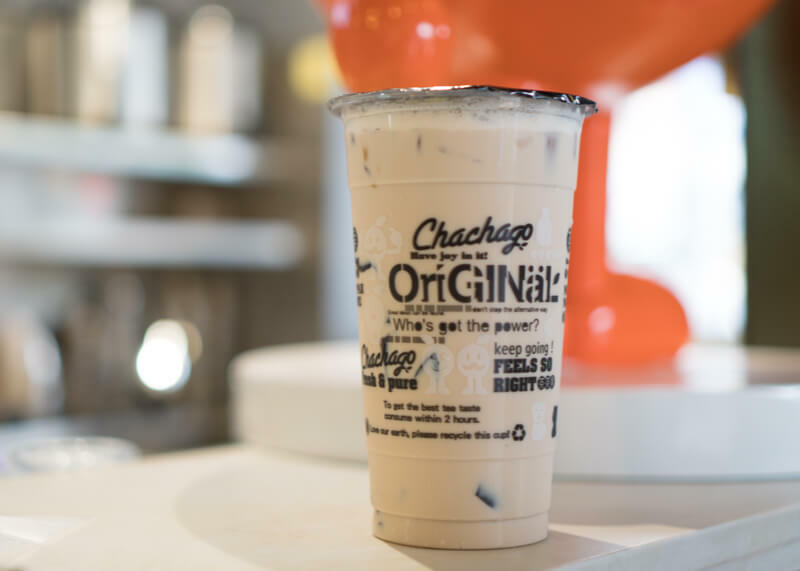 One of the owners speaks English, so it is easy to customize your order. 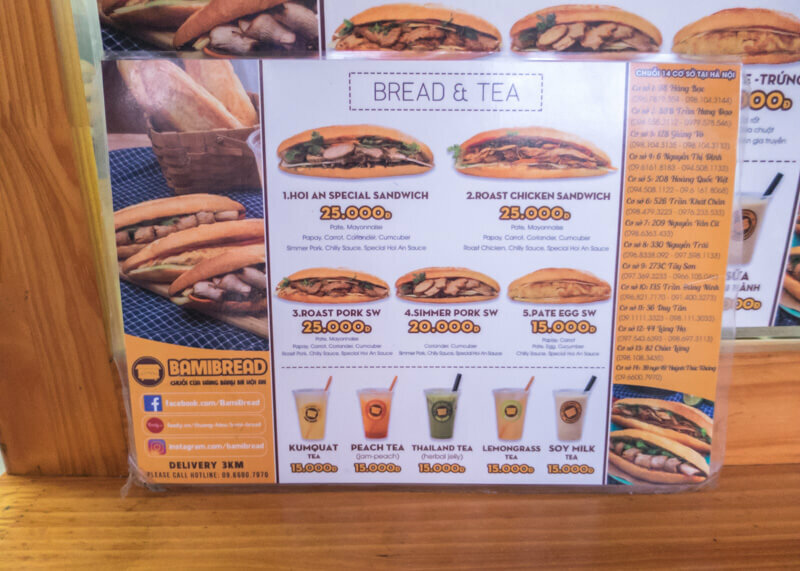 The sandwich prices are reasonable as they range from 20,000 VND to 25,000 VND. Ordering is straightforward too. 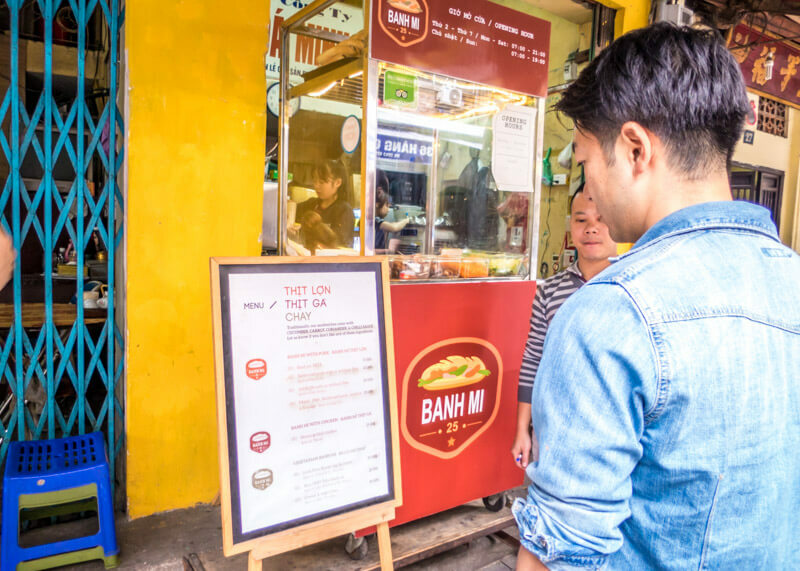 You order from a stall and either take your Bánh mì to go or eat in their seating area a few shops to the left of the order shop. The sandwich itself is a bit on the small side but still delicious and worth trying. This place is excellent if you are picky about certain vegetables and need the vendor to speak English. This place is top rated because the Vietnamese locals frequent it. I found the bánh mì to be good, but a little bit too oily for my standards. That is likely because the oil came from the egg, which is a must try if you go to this shop. One sandwich with egg and beef will set you back by 29,000 VND. This place did not disappoint! There are chain stores all across Hanoi so keep your eyes open for when you might need a mid-afternoon snack. I bought the Hội An special which had pate, mayonnaise, carrots, cilantro/coriander, pork, chilli sauce, and the special Hội An sauce for 25,000 VND. 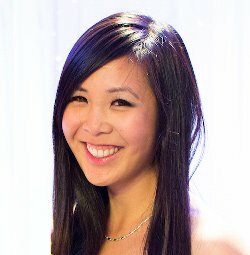 I can eat a huge batch of bánh cuốn all in one sitting! 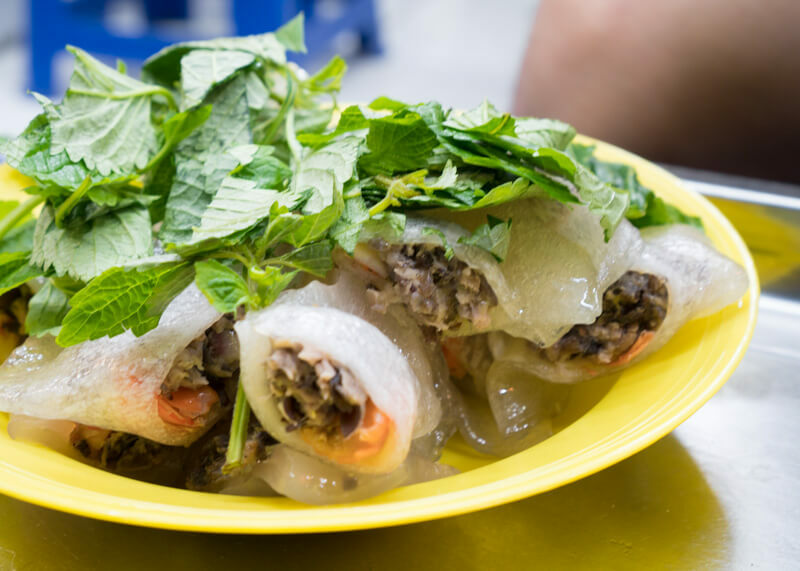 Bánh cuốn is a rice noodle roll dish mixed with seasoned ground pork, mushroom, and shallots. 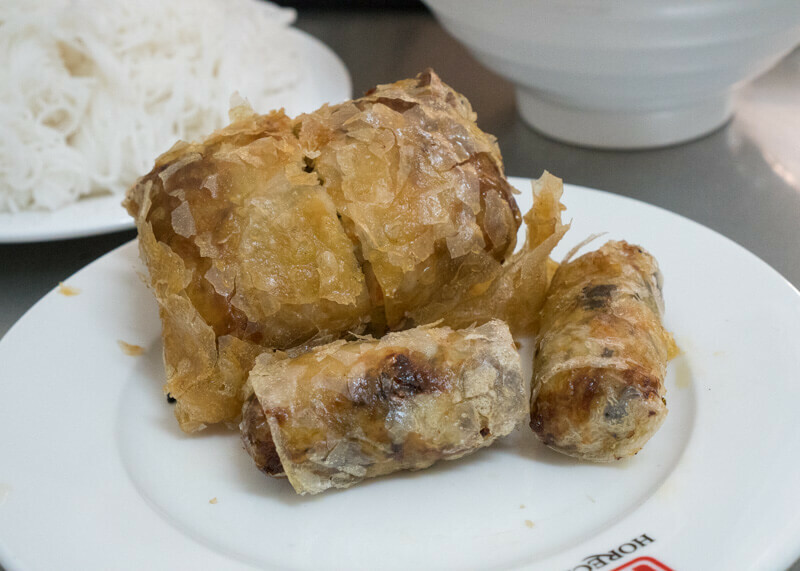 Pair it with a side of chả lụa (Vietnamese pork sausage), nước chấm (fish sauce) and cucumber and you have yourself a delicious meal (seriously, I am drooling as I think of it) bánh cuốn. While this dish is relatively easy to make, not all places make them well. The best ones use a fair mix of pork and minced shallots inside the roll. Some places tend to add a tiny bit of oil as they make the rice noodle roll, making the dish ultra delicious. 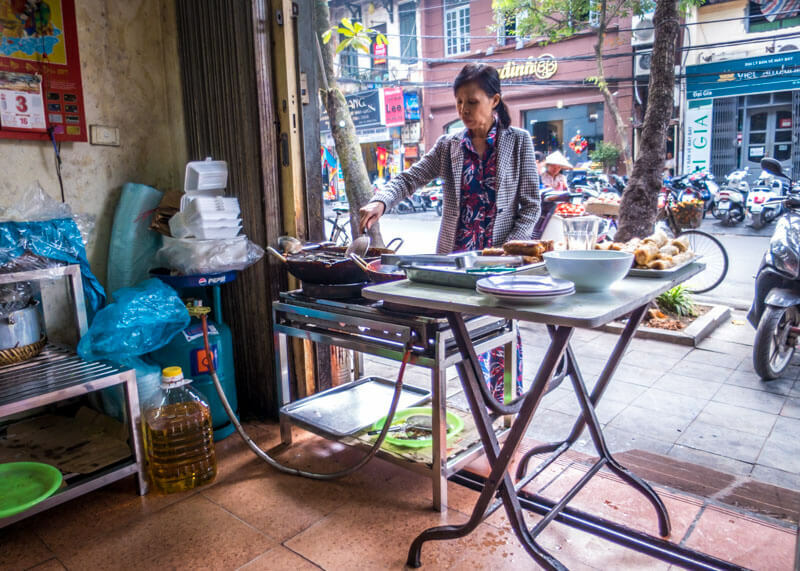 This street stall was the only place where I tried bánh cuốn outside of our hotels and let me tell ya, the dish really hit the spot. You can find ones with meat as well as a vegetarian option as well. Quán Bánh Cuốn Kỳ Đồng is in a little alley that had some other delicious looking restaurants worth trying. The prices here are quite reasonable. Nem Hà Nội Hanoi spring rolls are 60,000 VND, bánh cuốn with meat is 30,000, while bánh cuốn without meat is 25,000 VND. Not only do they serve a lean mean dish of bánh cuốn, but you can request for water bug oils? Sounds pretty gross to me…but if you try it, let me know how it went! You cannot say you’ve been to Hanoi if you didn’t try their delicious cà phê trứng at least once. Cà phê trứng can be puzzling to imagine at first – I personally expected to find a hard-boiled egg in the drink. But no, that’s not the case at all. The texture is thick and creamy, more akin to a creamy pudding or cream than anything. 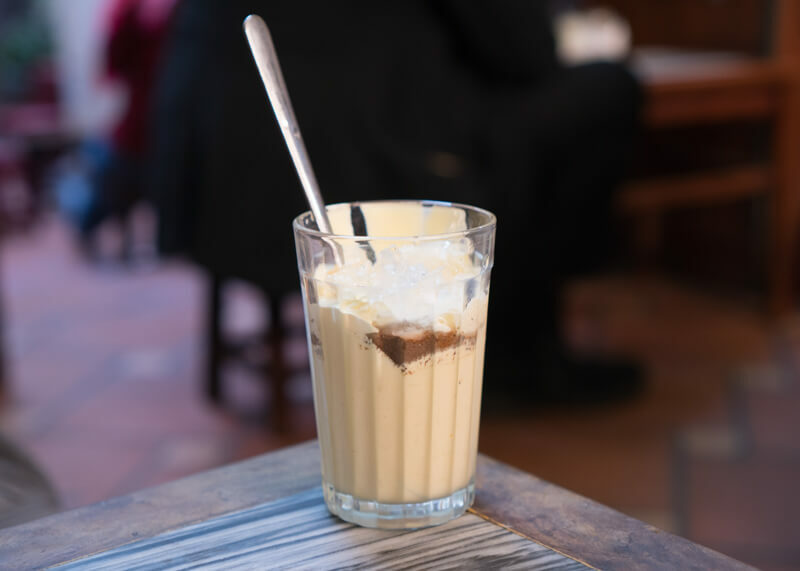 This delicious drink is created by whisking chicken egg yolk, Vietnamese coffee powder, condensed milk and butter into the drink. The invention was born out of necessity more than inspiration, as fresh milk was scarce in the 1940’s. 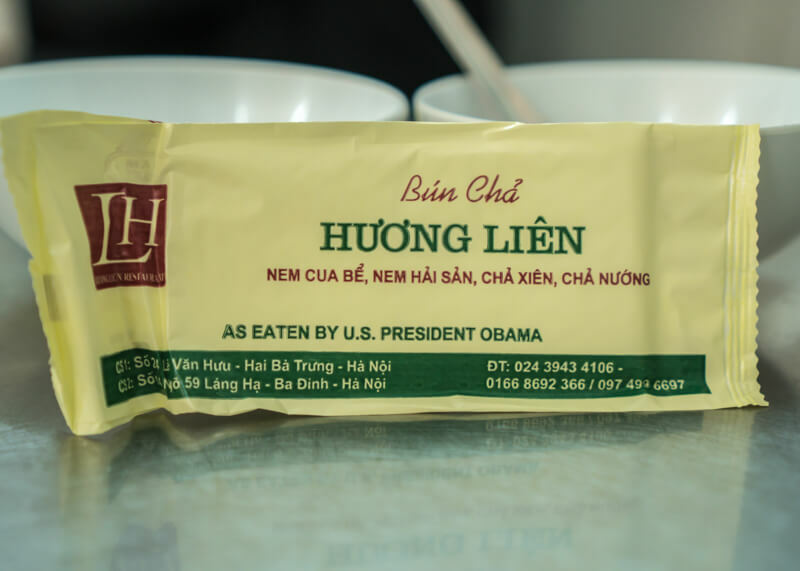 Mr. Nguyen Giang, the inventor, ran out of milk and decided to use egg yolks and condensed milk to make what is known as cà phê trứng. This drink is now a must try when you are in Hanoi. I won’t lie, cà phê trứng was something I never heard of before visiting Hanoi. Maybe it hasn’t made its way down south? Who knows, but all I know is that you must try this drink! But of course, you need to go to the original café that invented this drink. 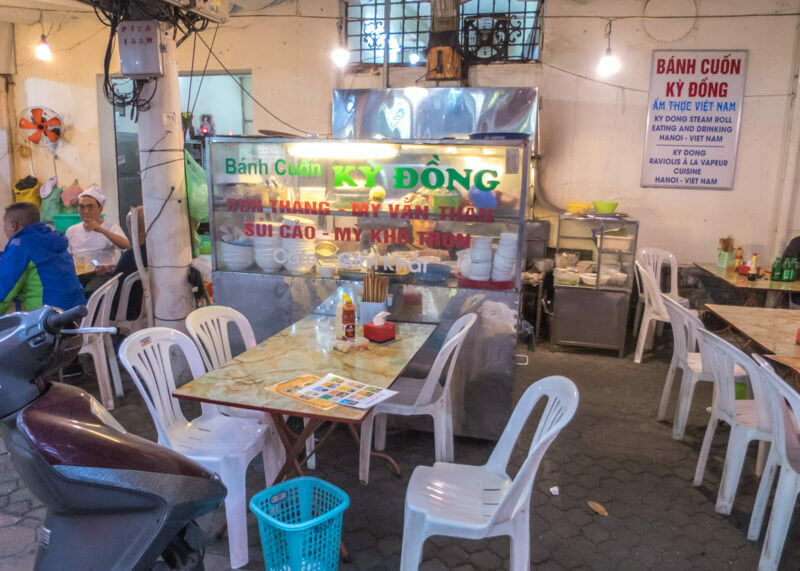 Expect to find a mix of Vietnamese locals, expats, and tourists sitting on really low stools. Tip: make sure to wear comfortable pants to avoid mooning anyone! There might be a bit of a wait, but you can spend that time deciding on what to order. Once you are ready to order, place your order with a waiter, and you are good to go! Find the menu of drinks on the wall! There is a long and dark alley that you have to walk through before you climb up the stairs. 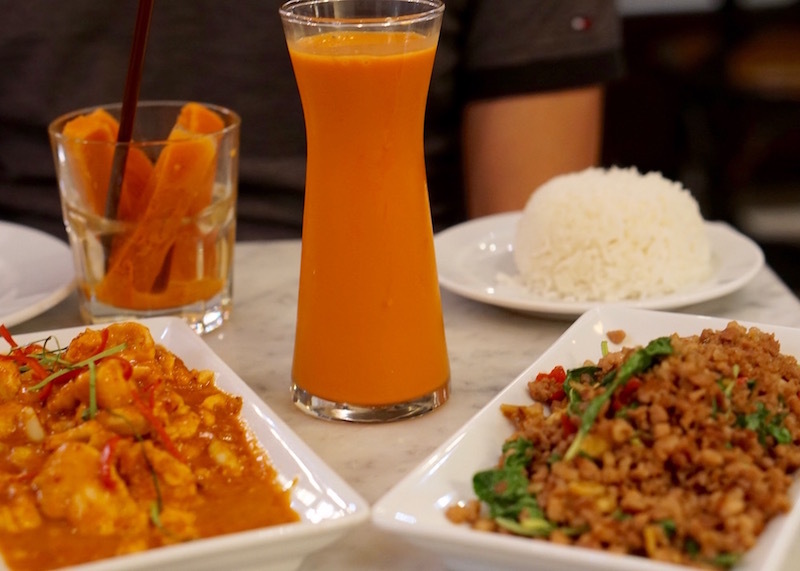 You will then see Vietnamese locals and expats alike, sipping on some delicious cà phê trứng. 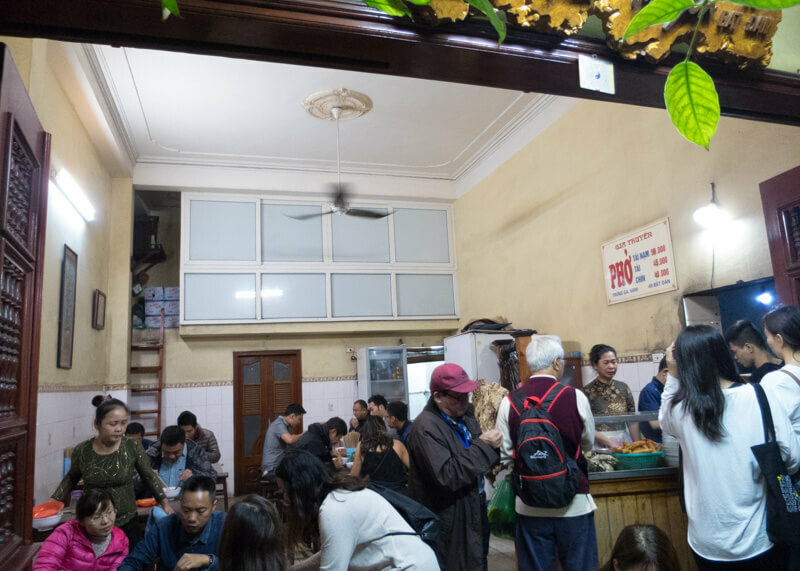 You will find many places outside of Giảng Café that serves cà phê trứng in Hanoi. I’ll be straight up honest though that the only place where the drink tasted delicious is at this café. No other café makes this drink quite the same. I’m not even kidding. I’m not even a big fan of pastries, but I found myself finding an excuse to pass by this shop almost every day. 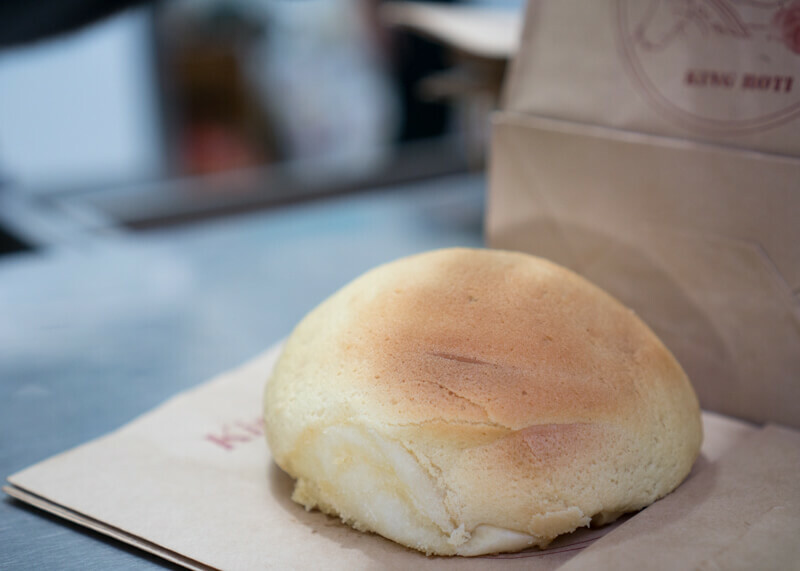 Honestly, take one bite into this bun, and you will understand why I am making a huge fuss about these buns from King Roti. These coffee buns are light, fluffy and not overly sweet. Each pastry that you buy is made fresh from the oven. 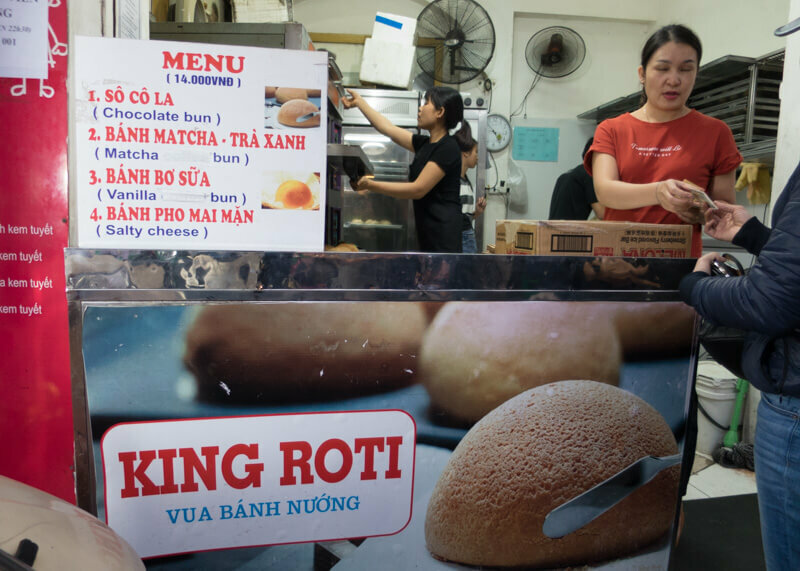 The only downside to King Roti is that it’s in a busy area where you smell a lot of gasoline from the driving motorbikes. 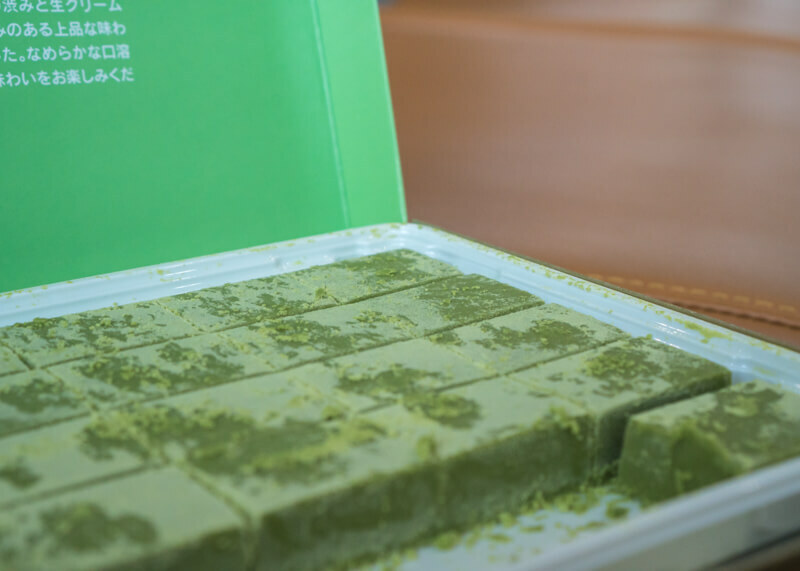 Mochi Sweets is a brand that creates Japanese mochi. Here’s the weird thing…I think it is a Vietnamese company because it’s all over Hanoi! These delicious desserts are bite-sized cakes in various flavours. These desserts are so delicate that there are, in fact, three layers to these treats. 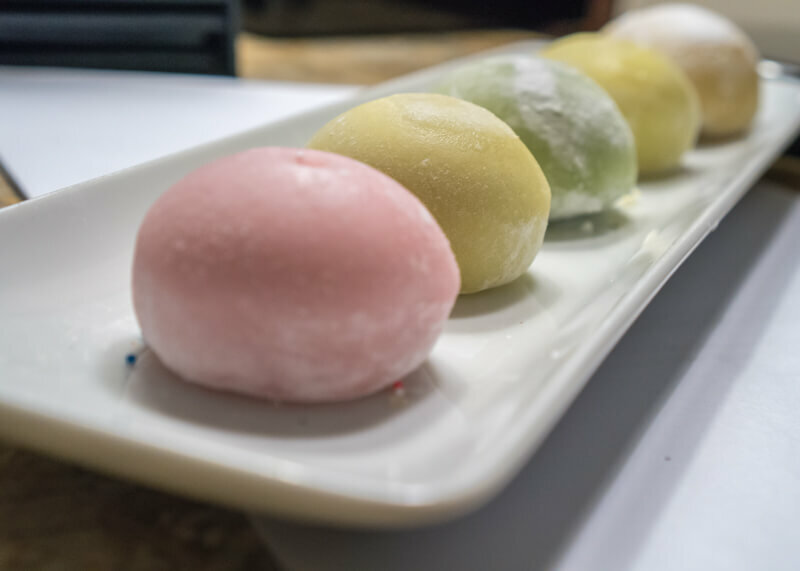 The outside layer is mochi while the middle layer is a paste. 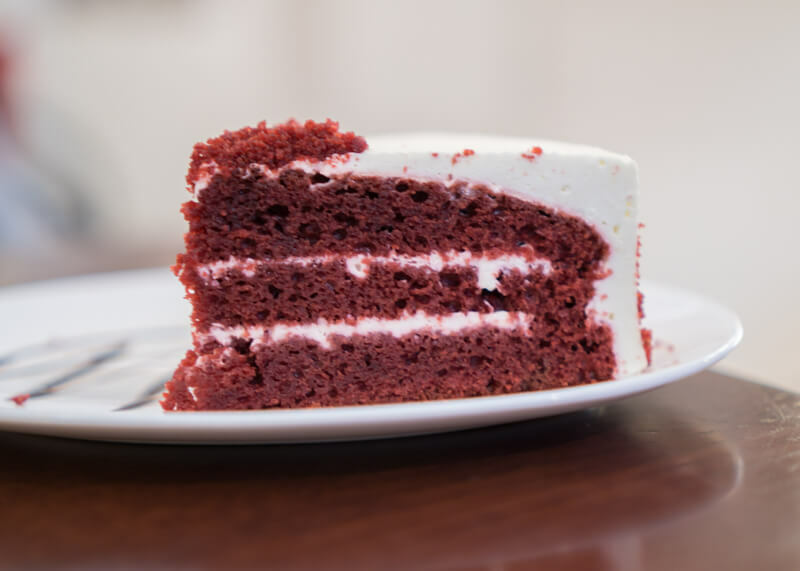 There is then an inner layer that has a rich, creamy filling. 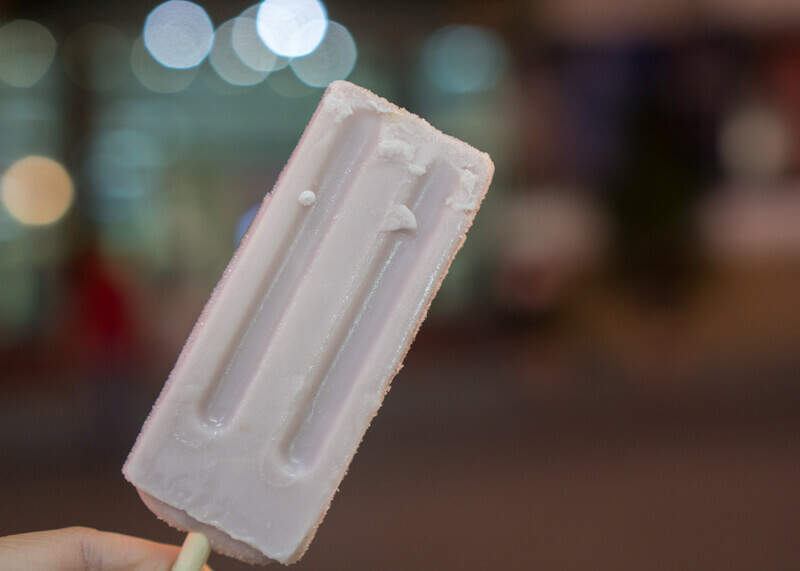 I first experienced these delectable treats when I was in Bangkok of all places. 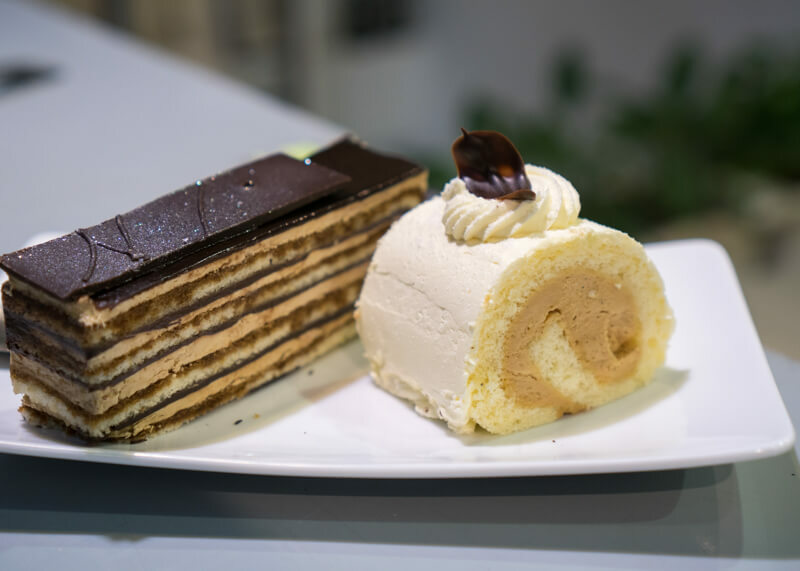 These cakes were soooo addictive that I planned a short trip to Bangkok during our year of travelling just to eat this incredible dessert. You can only imagine my disappointment when I found out the kiosk in Bangkok CLOSED! ARGH! 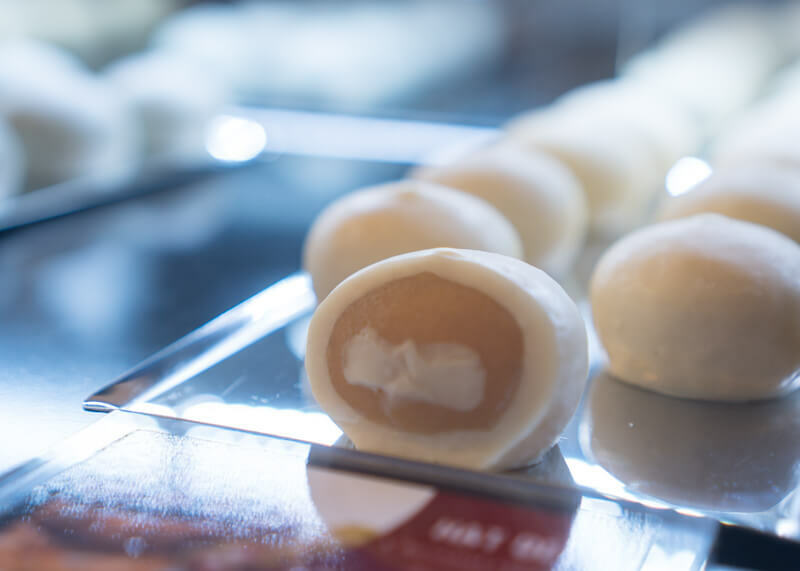 But I was happy again to discover Mochi Sweets throughout Vietnam and ate one (or three) like, every day. The flavours are a bit of a hit and miss. I will say that if you aren’t sure what to try, start with chestnut. Chestnut cream was my absolute favourite one. This shop has an old-school charm and is worth visiting at least once during your trip. The best drinks are under the section Sinh Tố Cộng Đổi Mới. I tried the cốt dừa đậu xanh 50,000 VND (coconut milk with mung bean smoothie), cốt dừa cà phê (45,000 VND, coconut milk coffee smoothie) which was quite delicious. I will mention though that the two times I visited this place was frustrating in that there were way too many smokers! So if you can’t stand cigarette smoke, consider moving or getting your drink to go. 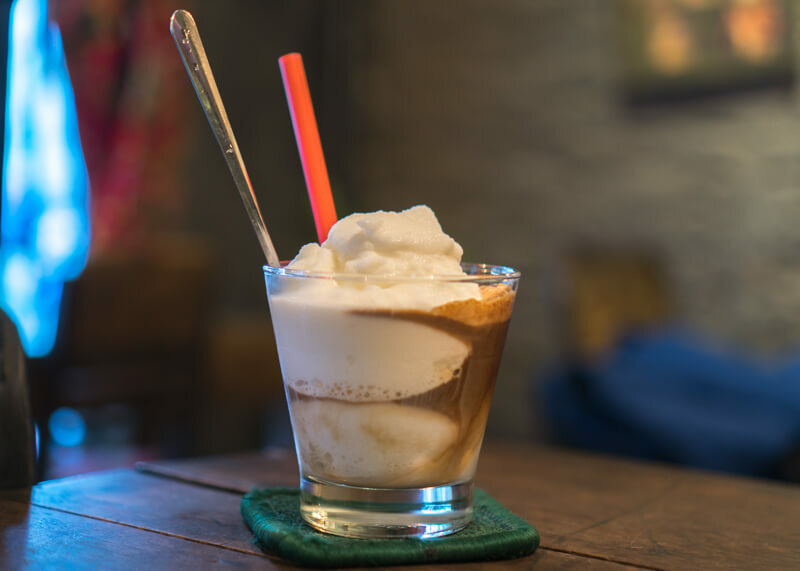 Ok, now that we got the best food to try out of the way, I have put together a list of drinks you might want to keep an eye out for when in Hanoi. Note, I wouldn’t go out of my way for any of these drinks. 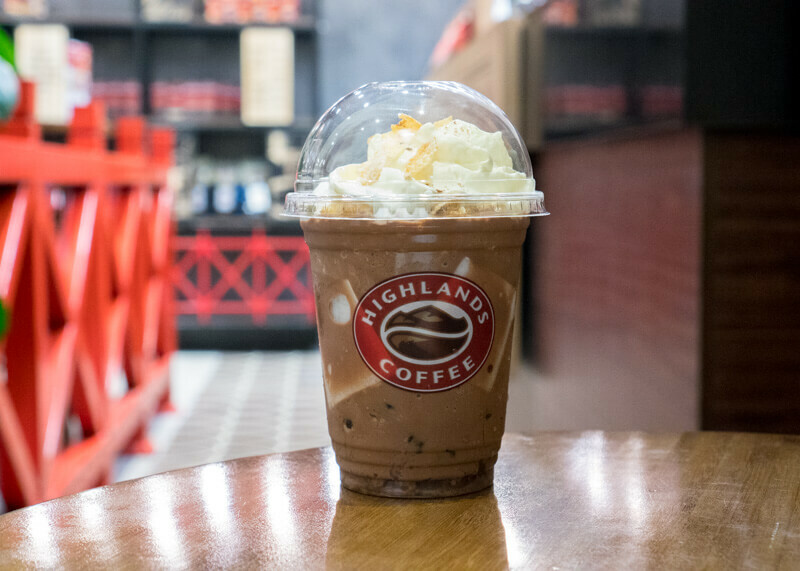 Highlands Coffee is a Vietnamese coffee shop that is ubiquitous across Hanoi. In fact, it has such a westernized feel that I thought it was an international restaurant chain! 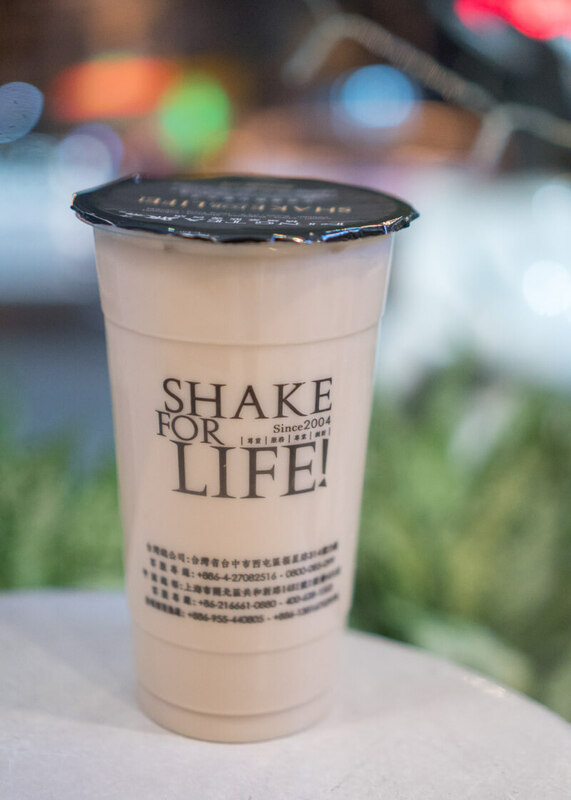 My favourite drink to order off the menu is the freeze drinks, which is a coffee smoothie in various flavours. For the best experience, go to the one on top of Aldo near Hoàn Kiếm Lake. Full disclaimer: I’m not a beer drinker, but I figured the cheapest beer in the world needs to be part of this list. Bia hơi Hà Nội is usually unpreserved homemade beer brewed daily. This drink is often brandless and very cheap compared to Western-style beers. More of an area than anything but you can find beer for as cheap as 5,000 VND ($0.21 USD). Happy hour starts around 5 pm as people flock to the area in the plastic child-size chairs at the Bia Hoi junction. It’s a great nightlife spot where you can sit and enjoy a cheap beer while enjoying dishes like roasted pork belly and fried chicken. Even if you don’t drink, it is still fun to walk around the area to get a sense of the vibe and listen to some of the live music performances. You’ll find that the area is very lively. The streets are closed to cars and bikes as restaurants extend their seating area to the streets. Some places were so packed that it took us a while to get from one place to the next. Packed but lively. 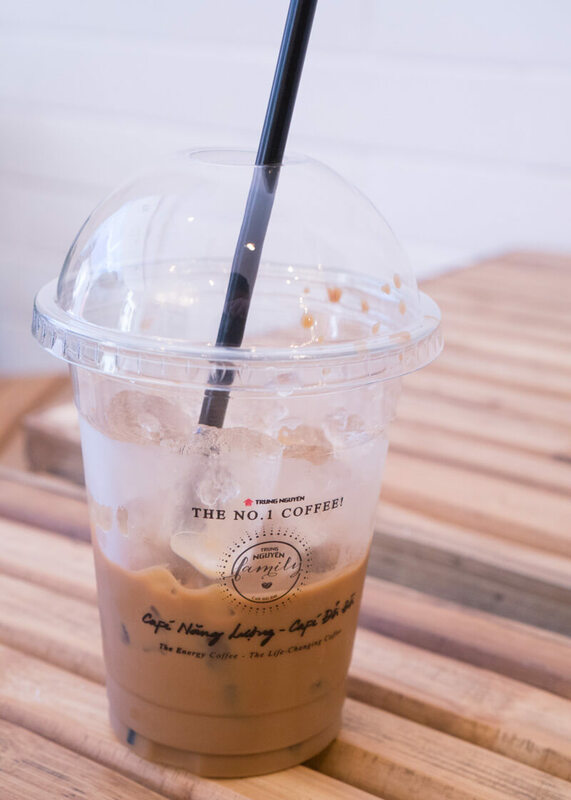 While I’m not a coffee drinker, I wanted to try some iced milk coffee while in Hanoi. 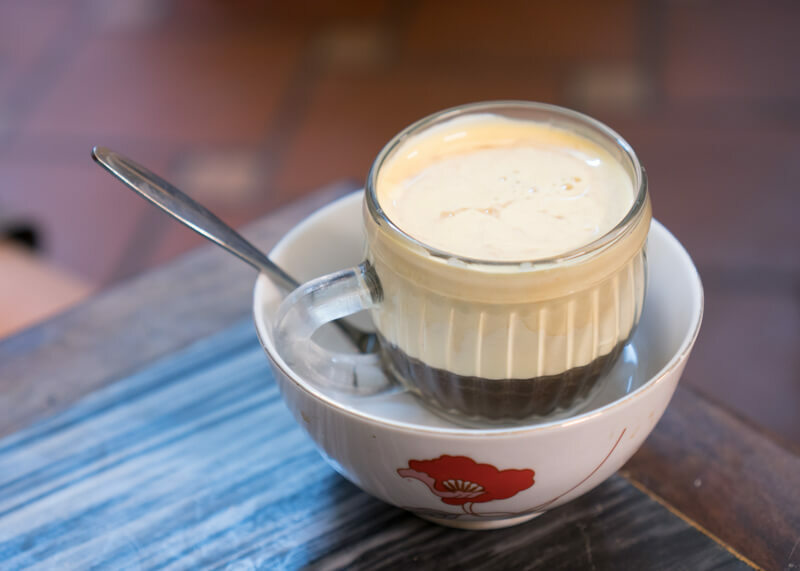 I saw Trung Nguyên Legend Cafés throughout Hanoi, and I figured I’d try it out. The coffee is expensive but delicious. I was very perplexed though to get a cup that looks half empty. 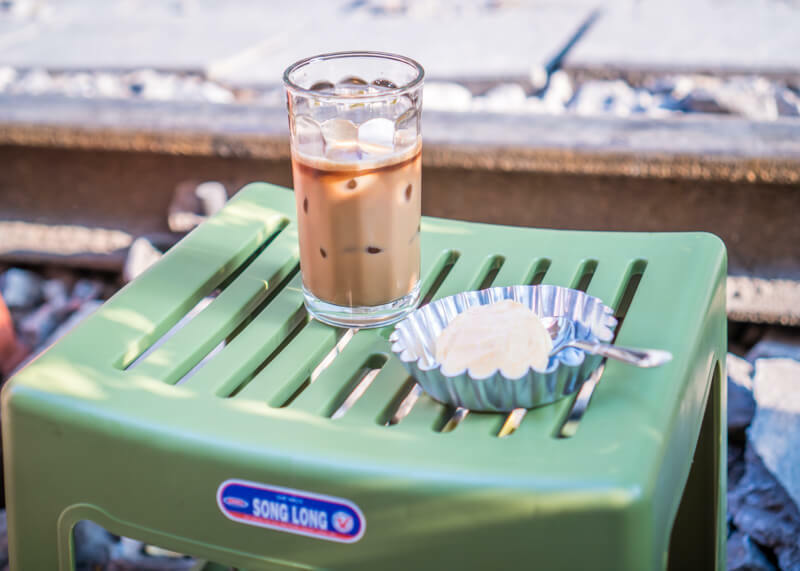 It seems that iced milk coffee is often served that way if you ask for it to go throughout Hanoi. The coffee shop itself has come modern décor and makes for a great place to stop and chill. This little coffee shop wins more on cuteness than anything since it is on Hanoi’s train street. I cannot find the shop on Google Maps for what it’s worth but you will see it when you walk along the train street. 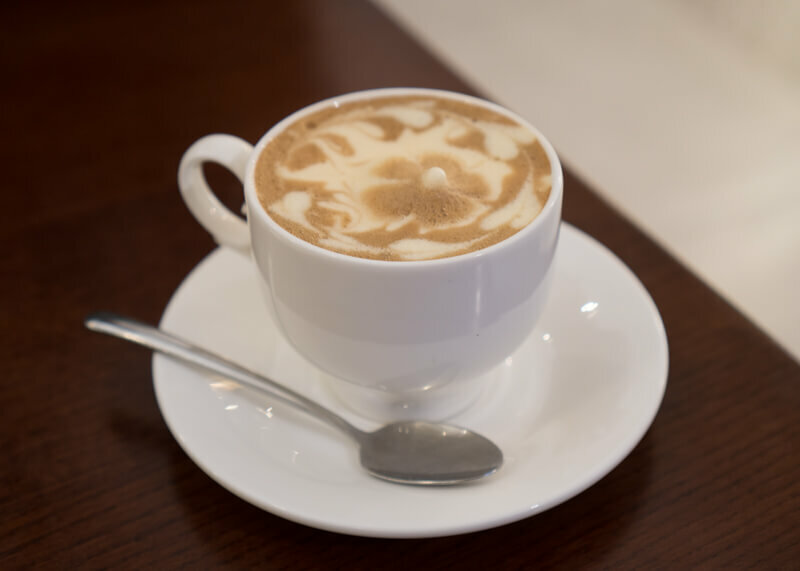 There are also many other coffee shops worth trying. The drinks itself are a bit overpriced but hey, how often can you say you had coffee while sitting in the middle of a live train track? The vibe at this café was nice, and we ended up meeting a nice couple from Koh Samui. The lady was originally from Scotland before she decided to move to Thailand for seven years. It’s cool to meet people like that while on the road. One of the biggest surprises I found in Vietnam were the number of Taiwanese bubble tea shops all across Hanoi! I’ve been to Vietnam three times now and do not remember ever encountering any bubble tea shops! The good news is that the prices are quite affordable and way cheaper than what you’d pay in North America. 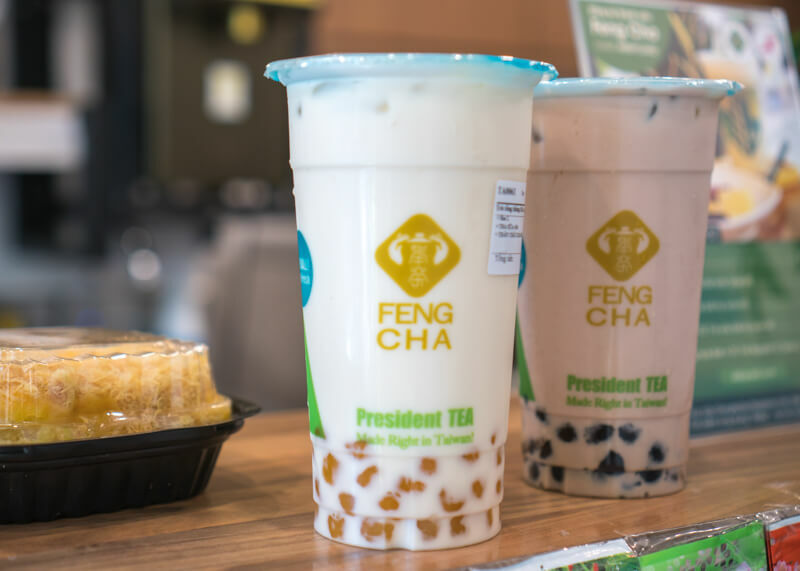 So load up on some bubble tea while in Vietnam. I tried three chains and liked all my drinks. Being the dessert addict that I am, I had to recommend some excellent desserts and cute cafes worth visiting! 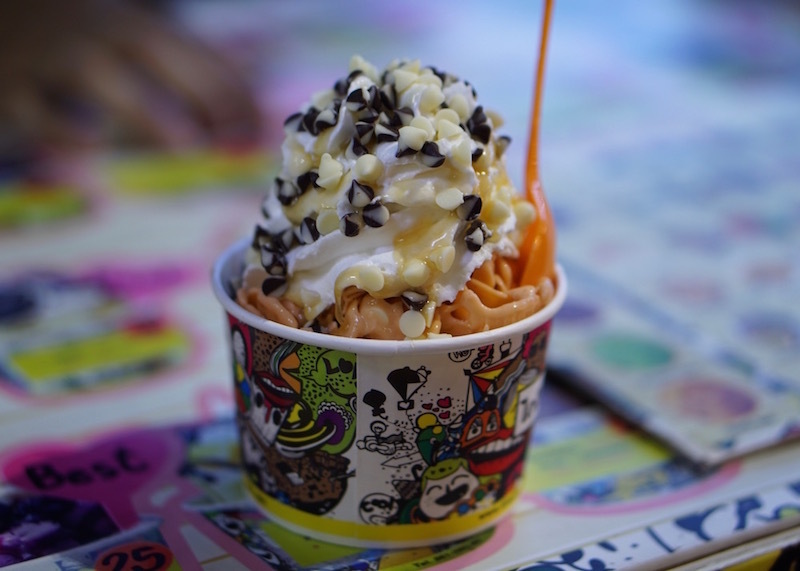 This ice cream shop serves some delicious traditional Vietnamese ice cream. The atmosphere is authentic and is a great place to stop by after a long walk along Hanoi’s French quarters. 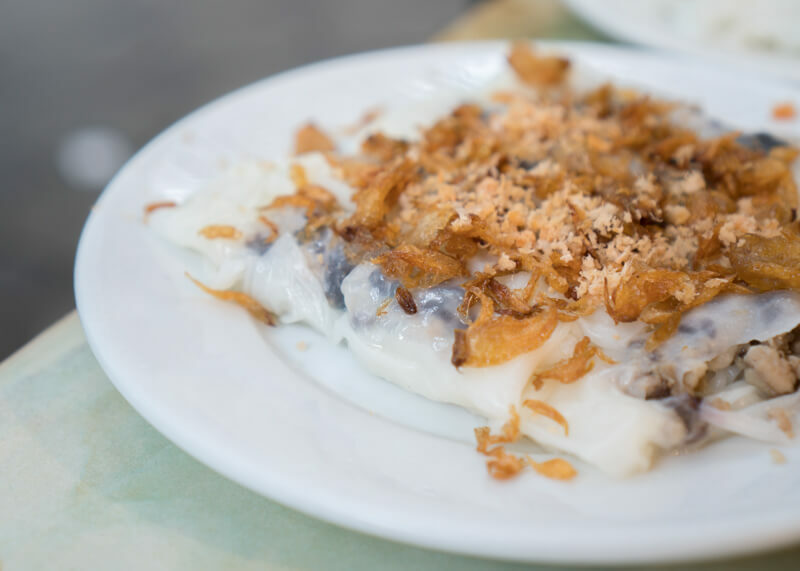 You’ll find the flavours to be simple and the treats to be mildly sweet, making it a favourite amongst the Vietnamese locals. 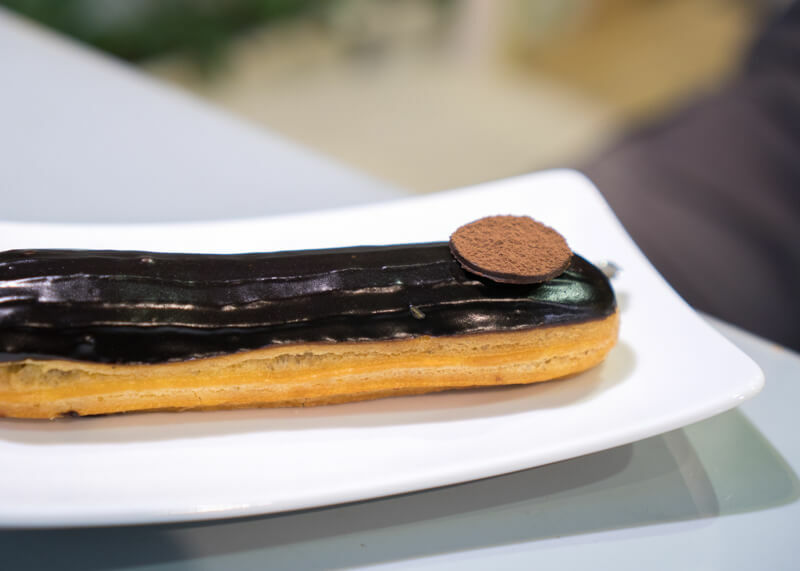 This dessert cafe has a great selection of desserts and is a charming shop. I ordered a lot of deserts, including truffe au chocolat and truffle and a la menthe for 5,000 VND. At first, I felt as if I was overspending at this shop. But then when I added up the price of all my desserts, I realize that I was getting three dessert and truffles for only 107,000 VND ($4.58 USD / $6 CAD). 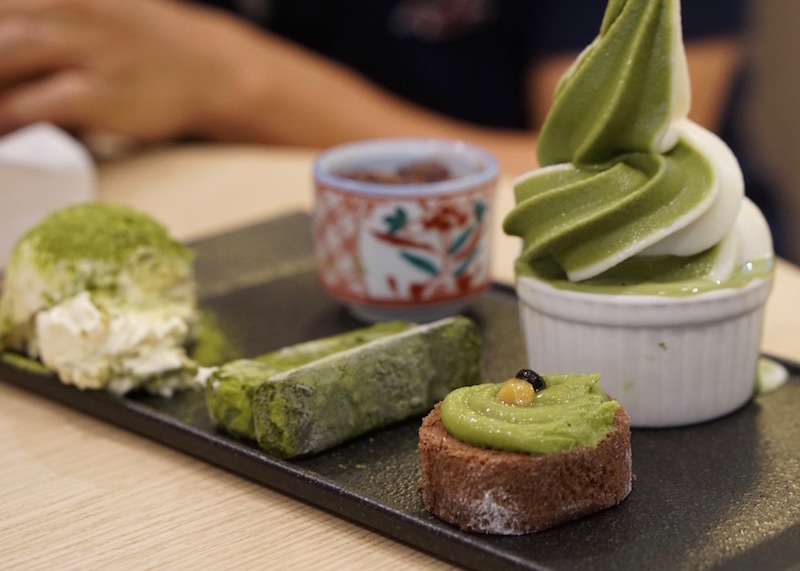 This little dessert shop is near Hoan Kiem Lake and so worth stopping by after a long day of exploring. 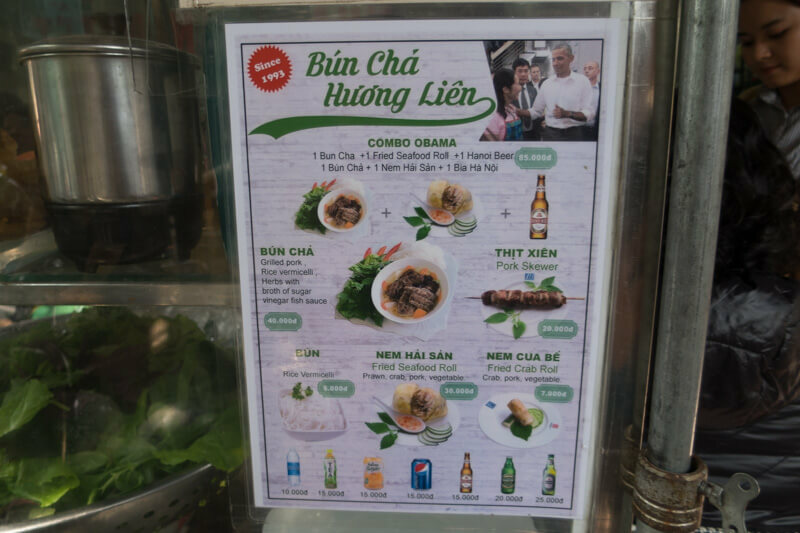 While prices aren’t dirt cheap, there are often specials – like the buy one, get one off special that I experienced while in Hanoi! 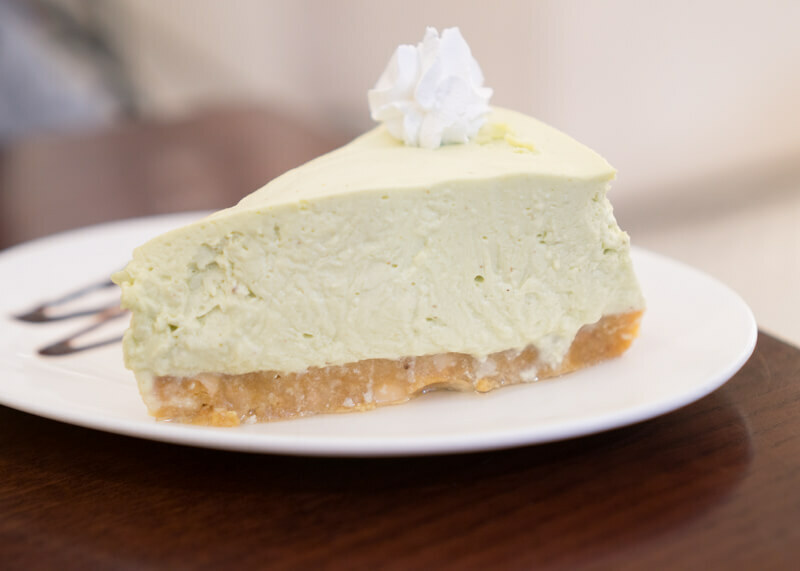 The avocado cake is sooo delicious and very much worth trying. The crust has this oat-like flavour, making it ever so tasty. The egg coffee was ok – it felt more like a regular cappuccino than anything, so I wouldn’t recommend it. If you’ve ever been to Japan, you’ve probably heard of Royce’ delicious nama chocolate. This chocolate is extra special and will melt in your mouth! Nama chocolate is a ganache and similar to the filling inside truffles. Nama, which means raw or fresh in Japanese is called so because of the fresh cream inside the chocolate. As a result, you have to consume this chocolate within a few days after purchase. Of course, I found Royce chocolate at the airport of all places and was ever so happy to eat them while waiting for our flight back to Chiang Mai. It is on the pricey side, but it is so worth trying! The only place I found this chocolate is at the airport, so make sure to check it out before you catch your flight. 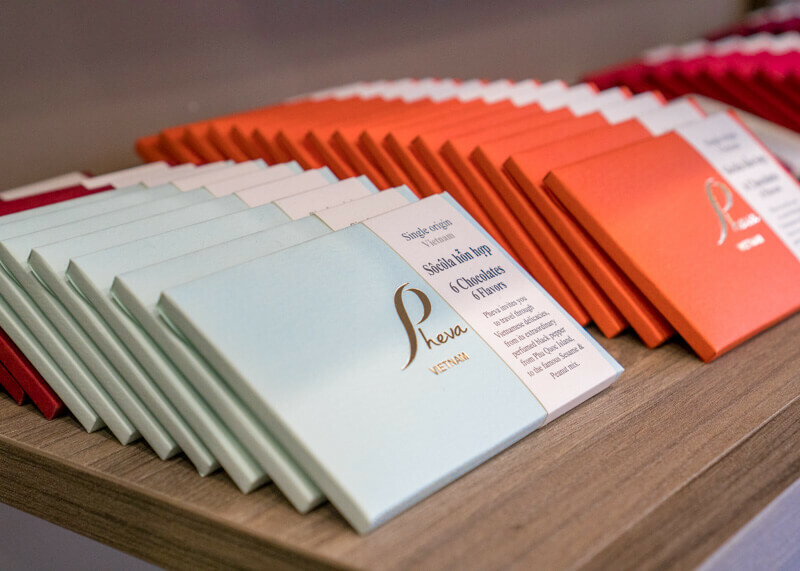 Pheva chocolate popped up a few times when it came to finding sweets to eat in Vietnam. While I liked that these chocolates locally made, I found the chocolates to be underwhelming for the price. 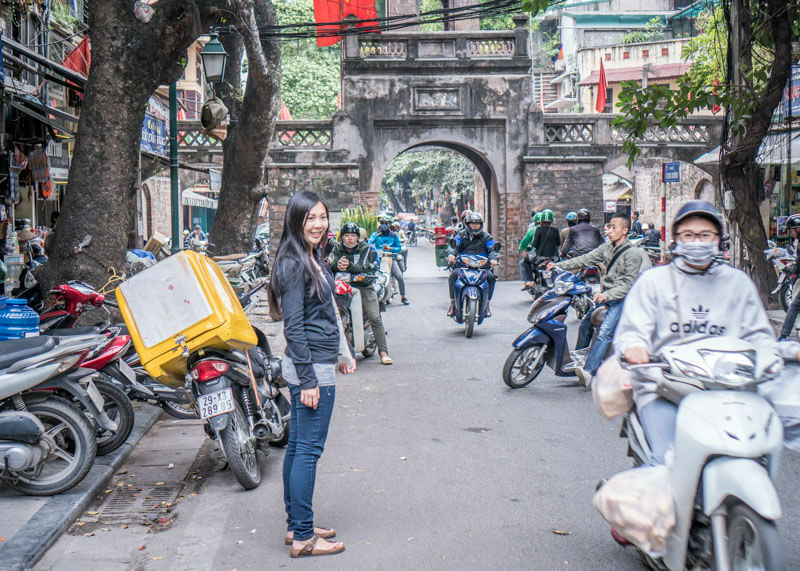 Ok, so when I was researching what to eat in Hanoi, a few other things popped up on my radar. While these dishes aren’t a must-try, it is something you might want to read about in case something piques your interest. 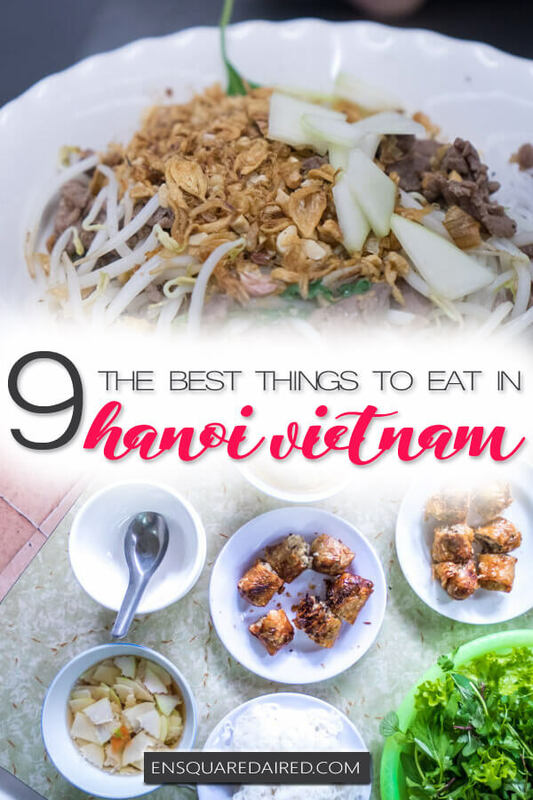 Note that most of the dishes here are NOT exclusive to Hanoi and you can find them in other cities in Vietnam. This Vietnamese noodle soup is not a must try in my opinion, but G♥ wanted to try it and so we did. I really don’t understand what’s so special about this restaurant. Apparently, the Vietnamese locals love this place. The first few bites of this beef salad were good. But after a while, I found it to be dry and too chewy. The dumplings were also widely raved, but I found it to be quite bland. Prices are also not listed so make sure to ask otherwise they will charge you twice the amount! Honestly, this steamed buns is very similar to Chinese pork buns (Baozi) 包子. For that reason, I skipped this dish because I didn’t see it as a Hanoi Vietnam specialty. But if you are new to Asian food, you may want to try this simple bun. The buns usually have pork, vegetables, and quail eggs. 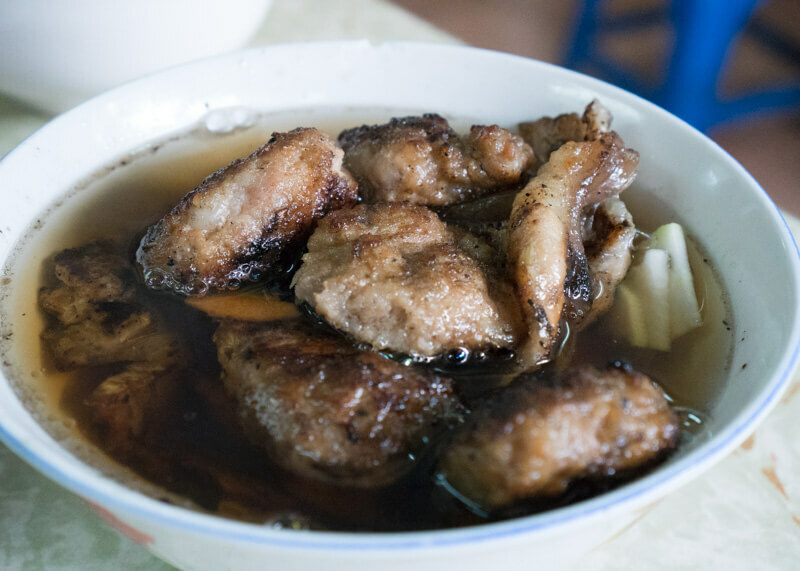 Vietnamese locals often eat this dish in the alleyways of the Hanoi Old Quarter. You will find restaurants serving delicious steaming bowls of noodles with lightly grilled fish. You’ll often find rice vermicelli, tomato broth, greens and small chunks of pineapple. As you can imagine, there is a mix of sweet and sour in the noodle soup. I personally do not like this dish and run to the furthest corner of the house whenever my family cooks this dish. But, if you are a fish lover, you may enjoy this noodle soup. 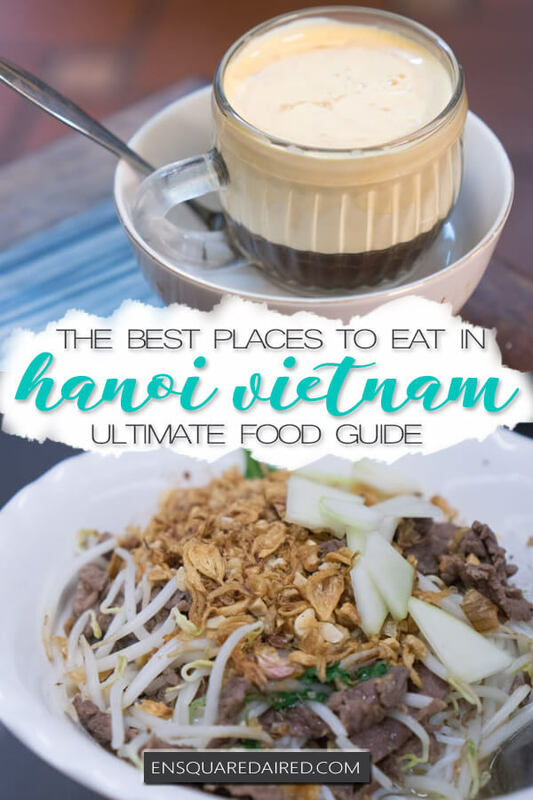 Ok, so I just gave you a TON of information on where to eat in Hanoi, including a map for you to use when you plan your trip (here it is again if you don’t want to scroll back to the top!). Ok, so here are some of what I think are the most useful phrases you will need when ordering Vietnamese food. Let me know if there is something you want to say and I can add it to this list. Good luck trying to pronounce any of these sentences because Vietnamese is not an easy language! Your best bet is to point to reference this blog post and reference the translation haha. Share your comments below on what you loved about the food in Hanoi Vietnam! 10 Amazing Desserts In Singapore That You Will Love Chiang Mai Street Food | 7 Affordable Dishes You’ll Want To Try Some Of The Best Desserts To Try In Chiang Mai 9 Of The Most Delightful Food To Eat In Bangkok Hanoi Travel Blog Diaries From My Year Of Travel (Part 1) Hanoi Trip Blog | Being Scammed For The First Time In Hanoi Why My Moon Hotel Hanoi Offers Great Value Is The Sheraton Hanoi Hotel Vietnam The Best Luxury Hotel In Hanoi? Previous Post: « Is The Sheraton Hanoi Hotel Vietnam The Best Luxury Hotel In Hanoi?